William and Margaret Joyce - Lord and Lady Haw-Haw - became one of the most mythologized, feared and ridiculed partnerships of the Second World War. His `Germany Calling' broadcasts delivered in an upper-class drawl, and her more feminine, though no less insidious, pro-Nazi wireless talks, were part of the very fabric of the Home Front. Yet when they were captured in May 1945, only he was charged with high treason - a fact even more surprising when it became apparent that, unlike Margaret, William was not a British subject . . . 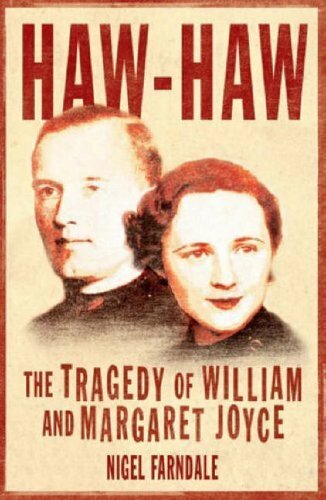 Authorized by William Joyce's daughter, Heather, and based on new interviews and previously unpublished archives, including letters, diaries and recently declassified Secret Service files, Haw-Haw is a meticulously researched and vividly written biography. In tracing William and Margaret's relationship from the rise of the fascist movement in the East End of London to the streets of war-torn Berlin, Nigel Farndale has written a compelling, evocative, and sometimes shocking study of two people whose passions overrode everything.